In rare instances, old structures may be able to be saved by new, sustainable interventions. The historic concrete bunkers along the Pacific Coast are an example. The U.S. military built them from before the Civil War until the late twentieth century and provisioned them for use, but they were never called into action. Many of these historic structures, also known as batteries, have fallen into disrepair due to their proximity to the ocean and exposure to salt air. But because they are situated with a clear trajectory to the sea, the batteries enjoy steady wind exposure, ideally suited for generation of wind power. Currently in the United States, wind farms are being constructed far from the point of use for the energy generated, but a small-scale approach, employing the batteries near urban centers as armatures for wind turbines would allow power to be generated closer to where it would be consumed. The now-defunct cannon bases could serve as support for vertical wind turbine towers, and the interiors of the batteries could house the switch gear for transforming the wind-generated direct current to alternating current; this could then be used to power nearby buildings. A display depicting the historic uses of the batteries or another type of adaptive reuse could be included as well. This proposal is a kind of swords-to-plowshares approach for adaptive use of a class of historic structures that have little hope of being saved by other means. An idiosyncratic proposal such as this one may be more symbolic than practical, but it serves to illustrate how new and old can be melded together in a manner that is mutually beneficial. 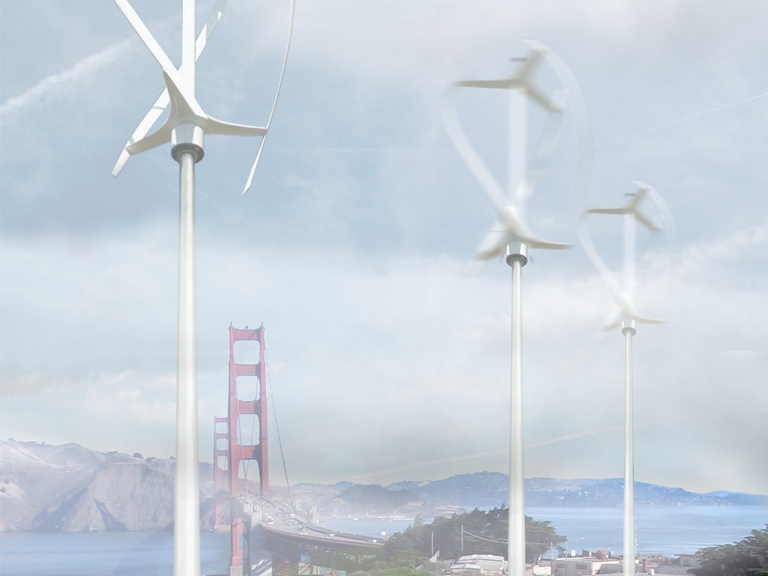 The turbine receives a foundation at no energy cost, and the battery itself is recharged with a new function.